The annual $30,000 Rea Award for the Short Story is awarded to MAVIS GALLANT. The only award in the U.S. exclusively for the short story, the Rea Award is given not for one specific work, but rather for literary power, originality and influence on the genre. Writers are nominated confidentially and the winner selected by a jury. Mavis Gallant has shown us over and over again what a marvel a short story can be. You can start to read any one of her stories (it does not matter if it is one you have read ten times before) and you are at once swept away — captivated, amazed, moved — by the grace of her sentences, the ease of her wit, the suppleness of her narrative, the complexity and originality of her perfectly convincing characters. She is a fearless writer, apparently equal to representing on paper any aspect of mind or time, however subtle, intractable, or evanescent. And the great gift bestowed is that such skills seem less like skill than like magic — it never makes you stop to admire it, but simply allows you to be carried into the depths of the story, and granted the piercing, powerful, live pleasure, the thrill of capture, which is what we are always hoping for when we take up a work of fiction. 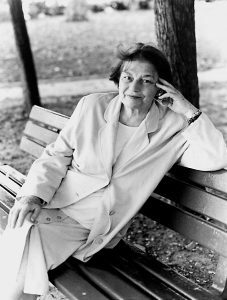 Mavis Gallant is the author of more than 100 short stories, most of which first appeared in The New Yorker, where she continues to publish. Her stories are collected, along with several novellas in: The Other Paris (1956), My Heart is Broken (1964), The Pegnitz Junction (1973), The End of the World and Other Stories (1974) and From the Fifteenth District: A Novella and Eight Stories (1979), Home Truths: Selected Canadian Stories (1981), Overhead in a Balloon: Stories of Paris (1985), In Transit (1988), and The Collected Stories of Mavis Gallant (1996). She is also the author of two novels, Green Water, Green Sky (1969) and A Fairly Good Time (1970), a play What is to be done? 1984, and a nonfiction work, Paris Journals: Selected Essays and Reviews (1986). During her distinguished career, Mavis Gallant has been made a Companion of the Order of Canada for her contribution to literature, and has been the recipient of the Canadian Governor’s General Award for literature for her collection of stories, Home Truths. The Rea Award for the Short Story, established in 1986 by the late Michael M. Rea to honor a living United States or Canadian writer who had made a significant contribution to the short story form. It was Michael’s desire to encourage writers to maintain loyalty to the art of short fiction and to ennoble the form.